Magicbox 'tower of sound' comes in four metallic colours | What Hi-Fi? 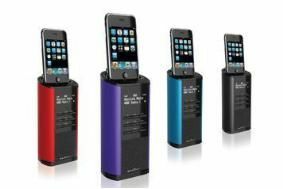 Naturally it will dock your iPhone or iPod, charge and play music from Apple's portable devices and wake you to your favourite music, the radio or a buzzer. You also get 20 radio presets, auto or manual scanning for radio stations, 12 or 24 hour clock and snooze/sleep functions. Standing just 15cm high, and at 8cm wide, it's compact enough for smaller rooms. The aluminium casing is finished in red, purple, blue or black. The Magicbox Tower goes on sale from the end of October for around £70.